In divided times, a well-told story can be a powerful gift. Throughout her career as a broadcast journalist, documentarian, and producer, Soledad O’Brien has demonstrated the power of good story telling to cut through the noise, contextualize the issues, and give audiences an opportunity to connect with others’ experiences. Over the course of two decades, O’Brien earned a prominent place in the American media landscape through her Emmy-winning coverage of race in America, as well as her award-winning reporting at the forefront of breaking news stories such as Hurricane Katrina, the BP oil spill, the Asian tsunami, and the 2012 election. 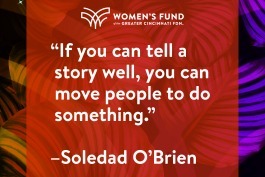 On April 25th, O’Brien will bring her masterful storytelling to Cincinnati for an event hosted by The Women’s Fund of the Greater Cincinnati Foundation. This event marks the ninth installment of the organization’s annual “A Conversation With” series, which was born in Women’s History Month as “a vehicle to highlight some dynamic, incredible, pioneering, change-agent woman who can elevate the issues we’re working on,” explains engagement officer Lauren Jones. The Women’s Fund began twenty-four years ago and was entirely volunteer-led until 2011. “It’s been the little engine that could for a very long time,” says Jones. And its primarily goal has been to understand and illuminate the issues facing women in poverty, which it divides into four key areas: childcare, living wage, training/education, and employment. “We thought, when we formed this fund, that the community would say they needed money and they needed grants, or something to that effect, but [instead] what we heard was that they needed research, and so we were able to shift focus to research,” she says. In addition to its own lay research committee, the fund commissions research through the University of Cincinnati’s Economic Center. It then works within the community as a non-partisan entity to inform and advocate for women struggling toward economic self-sufficiency. On April 25th, Soledad O’Brien will deliver the keynote — sharing stories from her own journey — followed by an on-stage interview with Cincinnati’s own Emmy-nominated news anchor, reporter, and host Charisse Gibson. The main thread throughout the evening, says Jones, will be the dynamics of representation: “How different voices at the table ultimately increases the bottom line for everyone, and what we can all do to be more inclusive in our own lives,” she explains. And O’Brien’s brand of nonfiction storytelling specializes in doing just that, illuminating important social, economic, and political issues through diverse personal narratives. Tickets are on sale now for “A Conversation With Soledad O'Brien” on Thursday, April 25th, 5:30 p.m. at Xavier University’s Cintas Center.